The result? A bomb, both critically and financially, it would be the only time Resnick directed a film, and it looked like the film would drift away into the ether, forgotten even by the few who actually saw it. However, movies have a weird way of changing well past their original course of creation, and with time, the film has become another in a series of cult classics, loved not because they are good, but because they are so very different than the rest of the pack. And that's certainly the case with Cabin Boy, the story of a fancy lad named Nathanial (Elliott) who is just graduating from finishing school. (The wheres and whens of the story are meaningless, as Elliott is far too old to be in school, and what seems like a very English or Colonial American setting also involves modern limos. It's all very Burton in its strange trappings.) Upon his graduation, Nathanial is supposed to take a luxury cruise to Hawaii, where he will take up the family business. 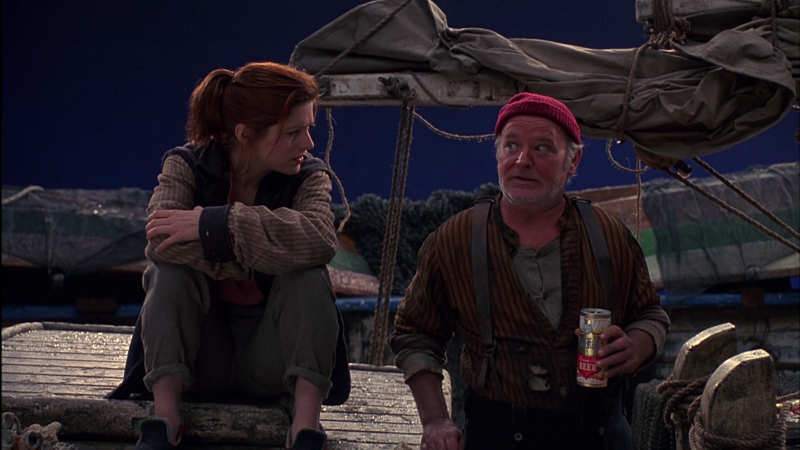 But through chance, arrogance and the efforts of a misanthropic sock-monkey slinger (Elliott's former boss David Letterman), the fancy lad finds himself instead on a fishing boat, and the culture clash is severe, as his obnoxious, preening moron runs afoul of the blue-collar fisherman, though dopey Kenny (Andy Richter in one of his first roles) takes a shine to him. If you remove the fish-laden opening titles and the end credits, the film checks in at around just 74 minutes, barely qualifying as a feature film (reportedly thanks to studio cuts after unsuccessful test screenings.) In that remarkably tight timeframe, there's not a lot of room for plot, and the film doesn't take that as a challenge, instead stuffing the runtime with weirdness, including a half-man, half-shark named Chocki (played with mute gusto by Russ Tamblyn), a six-armed housewife (the lovely and fun Ann Magnuson), a floating, talking cupcake (Jim Cummings) and way more. It's easy to see that Resnick (and Elliott, who worked on the story) wrote this movie with a Burton template, so the oddities are everywhere, and they make what could have been a pretty basic comedy into something enjoyably strange. But even more fortunate for the film's status as a cult success, they didn't have the budget to create such wonders the way Burton would have, so the entire production feels very hand-made, like you're watching a fan film version of the story, whether it's the obvious matte-painting backdrops or the shot-in-a-tank ocean. Some may view it as cheesy, but there's a definite charm and an off-kilter aesthetic at play here. Whatever the problems with the limited plot or the handcuffed production, as far as the acting goes, there's nothing to complain about in the least. Elliott is delivering the kind of aggravating obliviousness that has earned him his fan base over the years, and in this situation, that character is perfectly suited to annoy everyone around him. Paired up with Melora Walters, who plays a woman who ends up unintentionally coming aboard, he makes up an ideal kind of awkward, yet endearing pairing, even if there's some really problematic elements to their interactions. Richter is wonderful as the utterly dim Kenny, as are the crew--led by Brian Doyle-Murray--who are just the kind of character actors needed to act as foils to Elliott. If it wasn't for the fantastic cast, this film would be pretty unbearable. As it is, it's the kind of strange cinematic delicacy that will split audiences forever. Kino Lorber brings Cabin Boy home on one Blu-ray disc, packed in a standard-width keepcase, which is held in a slipcover that repeats the new painted cover art, seen on the disc's two-sided cover (with the original poster on the inside.) The disc features a static menu with options to watch the film, select scenes, check out the bonus features and adjust the set-up. There are no audio options, but subtitles are available in English. The 1080p, 1.78:1 AVC-encoded transfer here isn't going to win any awards, and since there's no mention of a new master, the imperfects on display may be the result of age. The image is far from stunning, as what should be pretty bold color (based on the design) is somewhat muted (particularly in the non-location scenes) and the level of fine detail is far from impressive. In fact, there are a few scenes that are so soft they seem like standard definition, and one shot of Elliott is straight up blurry (though that's likely a problem inherent in the film.) The thing is, for a film so low-budget and lo-fi, having a crisp presentation would likely only accentuate the flaws. The picture isn't pristine in any way, with minor bits of dirt and damage, but it doesn't seem like the transition to disc hasn't introduced any new problems. The strange thing is an inexplicable thin strip of black along the left edge of the frame. Presented with a DTS-HD MA 2.0 track, the sound is pretty fitting for the film's unassuming technique, ensuring the voices are easily made out, while the music is solid and sound effects--including the ambient sound during the film's predominant ocean-set scenes--are well-done inside the limits of a two-channel presentation. Cabin Boy is probably the last film people would expect to receive a loaded catalog release (even this disc's cover art describes the film as "The Contentious Classic that Angered a Nation"), but Kino Lorber continues to surprise, pulling together some archival material with new, in-depth extras for fans and detractors alike. First up is commentary by Elliott and Resnick, with author Mike Sacks (Poking a Dead Frog) serving as moderator. Neither man has positive memories of the tortured production, and they let everything that's bothered them about the film out in a track that's enjoyable for its honesty, along with a fair amount of behind the scenes info and trivia. Resnick hasn't directed a film since, so you can imagine what he has to say here. 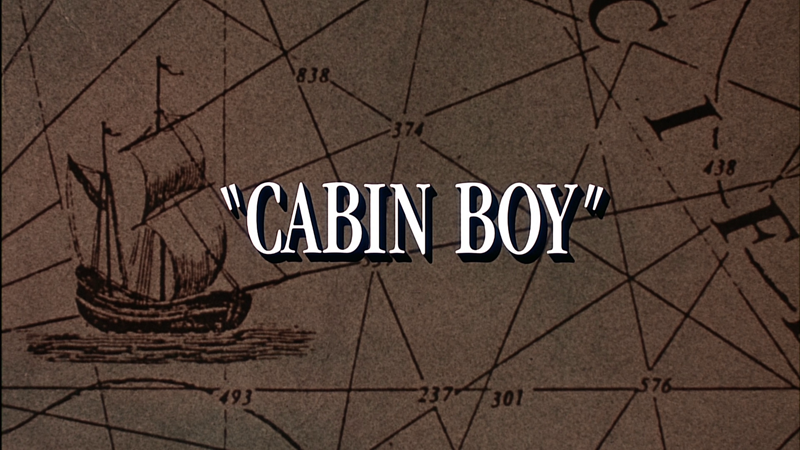 If the commentary isn't enough of a peek behind the curtain on Cabin Boy, "The Cabin Boy Chronicles" should do the trick. A seven-part interview with Resnick and Elliott that runs 45:50, it covers the production in detail, so there's some repetition from the commentary, but it's a bit more focused, and they talk about interacting with Burton, the lessons they learned and the experience of working with Letterman and Alfred Molina. There are some classic stories, some blunted bile and good advice for anyone about to embark on their first directorial effort. The rest of the extras hail from the vaults, starting with audition tapes for Walters and Richter (5:41). These throwback tryouts show these actors had their characters pretty much set at an early point, and it's clear why they got the jobs. There's a set of cast interviews shot at the time of the production (8:13), featuring all of the main cast members. The participants discuss the plot and their characters, as well as their experience with the production, though since these were shot for EPKs, they aren't exactly hard-hitting journalism. 5:58 of B-roll gives a look at how the the film's ship scenes were shot, as you get to see the set and the tank used. Then there's 6:29 of what is called "edited outtakes" all of which is different takes from one particular effects shot involving Elliott and a worm. If anything, it shows that filmmaking isn't exactly glamorous. Wrapping up the extras are five TV spots for the film (3:04), which all revolve around the same set of spoilery clips, and the film's theatrical trailer (1:45), which is pretty much the film in CliffsNotes form. In the package is a well-designed 12-page booklet with stills from the film and an essay by critic Nick Pinkerton, in which he details Elliott's career and places the film in that context, and details some of the film's more defining elements. 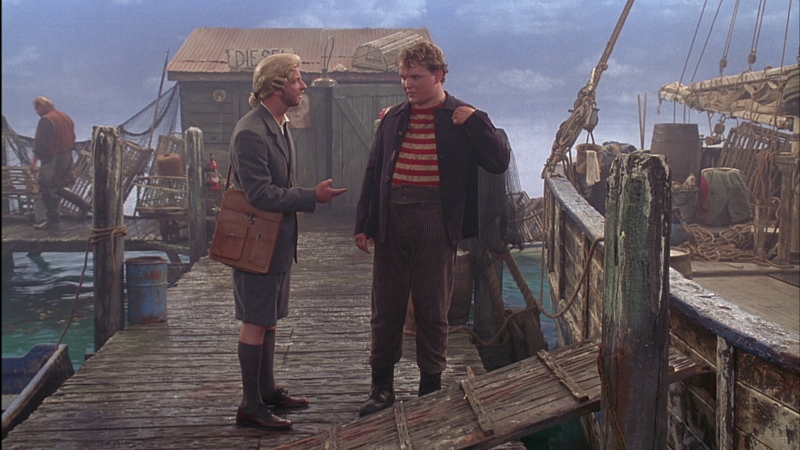 As with all of his unusual body of work, if you like Chris Elliott, you'll like Cabin Boy. If you don't like Chris Elliott, you definitely won't. It's as simple as that. This film is an odd little gem that's very existence is surprising, filled with enough odd ideas to keep its very brief 74-minute runtime consistently moving forward at an entertaining, if occasionally bewildering pace. The presentation on this Blu-ray is just decent (though no level of visual quality would help the low-budget production), but Kino Lorber has loaded up on bonus content, both old and new, making it a treat for the cult that has grown around Cabin Boy over the years. The great thing is, even if you don't like the film, the extras with Resnick and Elliott will help justify your opinion.